In rural Nicaragua, the majority of families still cook with wood stoves.The use of wood for cooking has contributed to the deforestation of many parts of Nicaragua. As firewood becomes scarce, families must travel farther in search of wood and scavenge and fall trees in critical ravine areas. The smoke from wood stoves causes respiratory illnesses and eye irritation in women and children. 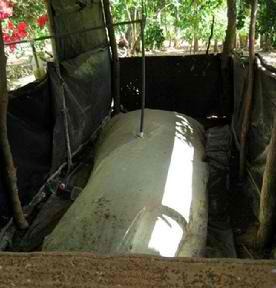 In 2009, Compas began to install biogas systems in La Paz. The systems capture methane gas from cow manure to use for cooking. The installation consists of a large piece of cylinder plastic that is placed into a pit 3 meters long, 1 meter wide and 1 meter deep. The bottom half of the plastic is filled with manure mixed with water and the upper half of the plastic holds the gas that is emitted from the manure. Thanks to grants from the LeBaron Foundation, we have now installed over 30 systems which are providing an average of 5 to 7 hours of cooking gas a day. The systems virtually eliminate the use of wood for cooking. Families are saving time and energy involved in splitting wood and starting fires and saving money in the purchase of firewood. Best of all, the systems are helping to save rain forests, and eliminating harmful wood fire smoke.